Without a doubt, the patients of VDO were the biggest winners of this event but we would also like to acknowledge the players who won some of the special prizes. Winner of the Putting Competition: Bill Lithgow, Jamie Luck, Ray Luck and Jamie Morton. As we approach $2.5 Million dollars worth of free dental care provided to our less financially fortunate neighbours in Haliburton County we would also like to thank all of the many volunteers in the clinic and at the golf tournament who put hundreds of hours into this cause and businesses who contribute their resources to help us keep our overhead costs down. VDO as a project is truly a community collaboration which highlights the best in what Haliburton County and many sponsors from outside the county contribute to those in need. For a complete list of Sponsors see the thank you note posted below. Our next tournament will be help on August 22, 2019. Those who have participated in the past and provided email addresses will be reminded to register in the spring. If you are not on this list, leave a message at the clinic at 705 457 3111 if you wish to participate next year. Today our patients had the pleasure to have their dental work completed by Dr. Gordan Markic who travelled from Mississauga Ontario to Volunteer. Dr. Markic was accompanied and assisted by his daughter Nicole. The Markics were able to help us see some patients from our waiting list and bring our total patients helped to 809. We have now offered 6685 appointments and $2,369,917 in free dental care to people in our community who cannot afford dental visits. This year, 34 fourth year dental students from the Faculty of Dentistry attended Volunteer Dental Outreach as part of a new dental outreach course. Students came for two days in pairs and were given individual instruction from supervising mentoring dentists Dr. Bill Kerr, Dr. Michael Proctor, Dr. Brad Oldfin, Dr. Kelly Rodgers and Dr. Alexandra Montian as they provided care to our patients. Patients were asked if they would be fine to be treated by the student dentists and were pleased that they didn't need to travel Toronto for this treatment. Students benefited from the "real dental" clinic experience and having their supervising instructions with them to teach about materials and techniques that had not been covered in their course. Many reported that it was the best experience they had received in all four years of dental school. Volunteer Dental Outreach will continue this program commencing in the fall of 2018 with the next fourth year class. For now, congratulations to all the graduates who are now fully licensed dentists and embarking on their careers. A special shout out to Dr. Sina Makaremi who chose to return as a volunteer dentist the week following graduation to see his first patients as a licensed dentist at VDO. Since opening in May 2011, the Volunteer Dental Outreach has helped 806 patients with their dental treatment, offered 6662 appointments and $2,363,914.in free dental treatment to those otherwise unable to afford to see a dentist. In 2016, researcher Loretta Kerr interviewed a number of dental patients on how having treatment at VDO has impacted their lives. At the recommendation of her research supervisor, this paper was submitted to the Journal of the Canadian Dental Association which has recently published Ms. Kerr's findings. To read more please see www.jcda.ca i4.pdf. The Article is called "More than Just Pulling Teeth: The Impact of Dental Care on Patient's Lived Experiences." Volunteer Dental Outreach was thrilled to be chosen by this wonderful organization of women in Haliburton, meeting to make donations to local charities. Volunteer Dental Outreach will be receiving donations from over 40 individuals who have each pledged to donate $100. This will help us cover our operating costs. Since we opened in May 2011 we have now helped 768 patients, provided 6246 appointments and $2,219,068.71 in free dental care to individuals with no where to turn due to financial barriers. Nancy Bishop, owner of our Minden and Haliburton Tim Horton's Restaurants was pleased to share the news with the Board that this years week of Smile Cookie sales raised $4951 for VDO. That's a lot of cookies! This year the Board and a few other helpers including Alana Bannister volunteered to decorate cookies to help keep up with the demand. It was a lot of fun but tough to keep the 5 a.m. routine going for long. Volunteer Dental Outreach fo Haliburton County wishes to thank Nancy Bishop and her wonderful team for all the extra effort it took to bake and promote the cookie sales. Our patients and our volunteers appreciate it very much. Thank you to all who participated, sponsored, volunteered and worked at the 7th Annual Volunteer Dental Outreach Charity Golf Tournament held at Blairhampton Golf Course on August 24, 2017. The weather was co-operative, the food delicious and the atmosphere joyful as 144 golfers played and raised funds to run the volunteer clinic which takes care of the dental needs of people in our county who cannot afford dental care. We were joined on the course by Pro Golfer Sue Ertl and Wayde Greer and Charlie Teljeur of TSN's Highways to Fairways. Jamie Luck was able to beat the pro and have his name drawn for a second Adirondak Chair donated by Cottage Country Log Cabin. Volunteer Dental Outreach has now helped over 750 patients and provided well over 2 Million dollars of free dental care for people in our community who have been suffering with unmet dental needs. Now in our 7th year we are pleased to report that University of Toronto is regularly sending students from its fourth year Dental Outreach course to help us meet the demand for care. This affords the students an opportunity to treat patients in a setting outside the dental school and have one on one mentoring with our volunteer supervising dentists. Patients and students are all appreciating this new partnership made possible due to fundraising efforts such as this tournament. Next years tournament will be held on August 23, 2018. Thanks to a new partnership struck with the University of Toronto Faculty of Dentistry, VDO had the opportunity to host Sasha Montian and Salvadore Alcaire. Sasha and Sal are only days away from becoming fully licensed dentists and generously used their skills to benefit 8 of our patients at VDO under the supervision of Drs. Bill Kerr and Michael Proctor. The Board extends sincere gratitude to Sasha, Sal and to Dr. Amir Azarpazhooh and Dean Haas for supporting this initiative. We also offer congratulations to Sasha and Sal who will graduate on June 9, 2017 and based on the compassion and technical skills they exhibited at VDO, will no doubt be exceptionally good and caring dentists. We look forward to meeting the next set of University of Toronto students who volunteer. May 19 was our 6th anniversary at VDO. As of May 19 we have been able to see 713 patients, provided 5642 appointments and $2,010,915.16 in free dental care for Haliburton County residents with no where to turn for dental care due to financial barriers. Don't forget the Volunteer Dental Outreach Annual Golf Tournament is set to take place on August 24, 2017 at Blairhampton Golf Course. Registration is filling quickly so if you wish to register, please find the forms on this website under the "Fundraising" tab. This tournament is our major fundraiser for the year and we hope to raise $55,000 towards the operating costs of running the clinic. If you can't attend the tournament, all donors to the Registered Charity will receive at tax receipt. As of July 13, 2017 our clinic has now seen 733 patients, provided 5804 appointments and provided $2,065,182.36 in free dental care. We are pleased that Brock McFadyen, RDH was able to come from Bright's Grove to see a number of our patients for dental hygiene. Also in July we are thrilled that Dr. Soma Ipe, Dr. Kelly Rodgers and Dr. Sasha Montian have joined our Volunteer Team. Thanks to all who are helping in this very worthwhile program. As we enter 2017 it is a good time to reflect on how grateful we are to the 20 individuals who volunteered this past year at the VDO clinic. To all our dentists, Dr. Purc, Dr. Kerr, Dr. Oldfin, Dr. Gray, Dr. Proctor, Dr. Tabri, Dr. James and Dr. Wong you have improved the lives of so many people with your compassionate care. To our dental hygienists Lindsay and Erin you provide a vital role in our program. Thank you both for donating your time. To our dental assistants Cheryl, Christina, Paula and Skye, you help by making the dentist volunteers and patients comfortable and ensure the highest level of sterilization for our patients. To the business assistants, Kathy, Lisa, and Andrea, you make sure patients are confirmed and the schedule makes the best use of our volunteer's valuable time. To our new denturist, Steve, so many patients are able to smile and eat better because of the time you are spending with them to replace missing teeth. Finally to Rahki and Jennifer, our university students, thank you for coming to help our dentists and denturist. Together this team saw 111 new patients this year bringing our practice total to 699 people helped. The office volunteers provided 1105 appointments in 2016 for people who would otherwise not have been able to seek dental care. Thank you to our clinic manager, Alana who has taken an active role in patient education and makes sure the clinic is running smoothly. Also thank you to our dental assistant Lynette who helps the dentists with efficiency allowing them to work two rooms. Thank you to the Board of Directors, Dr. Bill Kerr, Janis Parker, Betty Mills, Melanie Aldom RDH, Mark Arike, Sandra Slauenwhite-Box, Brigitte Gebauer, Kathy Purc and Lisa Kerr for providing good governance as well as actively organizing fundraising activities and volunteer appreciation and recruitment. And finally, to Dr. John Purc, who saw his last patient December 20th after five and a half years volunteering weekly at VDO, your contribution to VDO is never going to be forgotten. After 46 years as a dentist, you deserve a retirement filled with all of the activities you enjoy and we wish you all the best. To date this clinic has provided 5535 appointments totaling 1,962,513.96 in free dental care for 705 low income residents of Haliburton County since opening in May 2011. The Board of Directors of Volunteer Dental Outreach announced this month that after all the expenses of the golf tournament were paid, $55,000 was raised with all proceeds to be used for operating expenses. Thanks to all the volunteers, corporate sponsors, donors and golfers who made this event such a success. Thank you to Chris Carl and the staff of Rhubarb restaurant who served a beautiful lunch. Plans are already underway for next year's golf tournament. Ladies Closest to the hole winner was Dale Bull. Only twelve golfers were able to �Beat the Pro�-Sue Ertl from Florida who joined the tournament. Of these twelve golfers, Dan Fagan�s name was drawn to win the Red Muskoka Chair donated by Cottage Country Log Cabin Trading Co.
Next year�s tournament is set to take place on August 24, 2017 and a number of foursomes have already committed to attending. Early registration is suggested as a number of people were disappointed this year to hear the tournament sold out in early June. The Board of Directors of Volunteer Dental Outreach was very pleased to accept a donation from Nancy Bishop, owner of the Haliburton and Minden Tim Horton locations on December 15 at the VDO clinic. The funds were raised during the Annual Tim Horton's Smile Cookie campaign. Each cookie sold for $1.00 represented a donation to VDO- that's a lot of cookies. Thank you to Tim Horton's, Nancy Bishop and all who participated by baking and buying cookies. The funds are used to operate the clinic where volunteer dentists and dental hygienists provide free dental care to our local residents of Haliburton County who cannot afford dental visits. The owners of Fort Irwin Marina recently donated more than $1,200 to the Volunteer Dental Outreach for Haliburton County. From the May long weekend to Labour Day, Maria and Brad Willing collected $310 in donations from customers at their marina, which they matched. More than $400 was raised through dinners held with friends on Haliburton Lake and about $100 came from the Haliburton Lake Cottagers� Association. �I pick something different every year,� said Maria of their annual charitable campaign, now in its fifth year. The marina is located at 5002 Haliburton Lake Road. The Board of Directors of Volunteer Dental Outreach is so grateful to Brad and Marie Willings and all who donated to Volunteer Dental Outreach. What wonderful people to help our patients in such a meaningful way. The Board of Directors is actively preparing for the 6th Annual Volunteer Dental Outreach Charity Golf Tournament at Blairhampton, August 25. We are pleased that the event has SOLD out two months in advance and the weather forecast looks fantastic. We are expecting it to be really great day. Our clinic has now helped 665 people and provided 4886 appointments which would have cost $1,714,592.10. The really great news is that we have been able to reduce our wait times considerably and are able to offer patients appointments within a week or two of their approval. 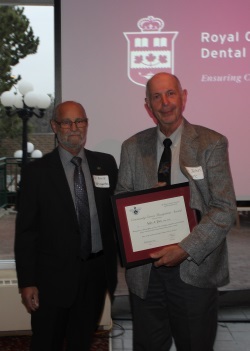 Dr. John Purc was awarded the prestigious Community Service Recognition Award by the Ontario Dental Association on April 21, 2016 at the spring meeting of the Peterborough Dental Association. At the presentation, Dr. Purc was congratulated for all the dedication and generosity he has shown treating patients at Volunteer Dental Outreach, helping new dental assistants and dental hygienists gain work experience. It was noted that Dr. Purc retired from private practice but maintained his license in order to volunteer in our community to help those in need. In his acceptance speech, an emotional Dr. Purc urged the other dentists in the room to consider volunteering a day or two a year and or support VDO by attending our 6th Annual Golf Tournament on August 25, 2016. Also present at the meeting was Irwin Fefergrad, C.S., B.A., B.C.L., LL.B Registrar (Certified as a Specialist by the Law Society of Upper Canada in Civil Litigation and Health Law) Irwin Fefergrad is the Registrar of the Royal College of Dental Surgeons of Ontario. Mr. Fefergrad was present to address the room about The Government, The College, The Law. It was very fortunate that Mr. Fefergrad was present to witness Dr. Purc's award presentation and is now very aware of the work done at the VDO clinic. In his remarks Mr. Fefergrad commented how impressed he is by the dentists such as Dr. Purc and Dr. Kerr who take time out of their practices and personal life to volunteer to help those unable to access dental care due to financial barriers. At this time we currently have 14 approved patients waiting to be treated at the clinic and welcome any new volunteer dentists and dental hygienists who feel called to help. Volunteer Dental Outreach has reached another major milestone! It only took three years for the Volunteer Dental Outreach (VDO) for Haliburton County to reach a $1 million milestone. Less than a year-and-a-half later, the charity has provided an additional $500,000 worth of dental care to local residents in need. This is great news for VDO patients. Since the VDO opened in May 2011, its team of volunteer dentists and hygienists have provided $1,551,493 in free urgent dental care to 597 patients in 4,407 appointments. These patients reside in all four municipalities within the county. While hundreds of people have received necessary dental care, it's been an ongoing challenge to reduce the number of patients on the wait list. As of Jan. 18, it included 34 people, four of whom on the high priority. Eight are in need of dentures. In addition to volunteers, fundraising is also critical to keeping the clinic's doors open. With the costs of dental supplies, equipment and rent, the annual operating budget is $90,000. This past August, the fifth annual VDO golf tournament raised more than $48,000. The event was held at Blairhampton Golf Club. The sixth annual tournament will take place Aug. 25, 2016. To find out how you can be part of the team or to learn more, visit www.dental-outreach.com or call 705-457-3111. The VDO board of directors would like to thank Skye Smith for her contributions over the years as head dental assistant, and wish her all the best in her new position with Dr. David Butera's office in Haliburton. Dental assistant, Alana Bannister has assumed the position of business assistant and head dental assistant Jan. 19. Volunteer Dental Outreach for Haliburton County is a registered charity which operates to provides free urgent dental care for low-income residents of Haliburton County. The clinic is located at 739 Mountain St. in Haliburton. The Board of Directors of Volunteer Dental Outreach would like to thank Nancy Bishop, owner of the Minden and Haliburton Tim Horton's restaurants for the donation of $3920.00 raised during this year's Smile Cookie Campaign. To all who purchased smile cookies this year- thank you too! Since we opened our doors in May 2011, this clinic has helped 581 people by providing, 4229 appointments or $1,474,839.83 in free dental care to people in our community who could otherwise not be able to afford much needed dental care. We also would like to thank the 24 dentists, 18 dental hygienists, 13 dental assistants and 8 front desk business assistants, Image Dental Labs and Brentwood Dental Labs who have volunteered their time. It is these people who come together to change the lives of people in great need right here in Haliburton County. Merry Christmas and Happy 2016 to all. This August, VDO was able to run an advertisement in the Ontario Dentist magazine as a result of a grant received from HCDC which covered 80% of the expense. We were also able to run a smaller version of the ad in our local newspaper, The Highlander. As a result of this ad, three new dentists, Dr. Tanya Farooq, Dr. Kambiz Koosha and Dr. Rita Calotti have recently volunteered seeing a combined 17 patients at the Volunteer Dental Outreach Clinic. We also welcomed Dr. Rohit James Hallowe'en Day. Dr. James hopes to join us again in the spring. With the help of these newest volunteer dentists we have been able to help 575 patients, offering 4146 appointments and providing $1,444,684.83 in free dental care to patients in our community who have gone without dental care due to financial barriers. Thank you to our newest volunteer dentists, those who have volunteered in the past and especially to the dentists and hygienists who continue to volunteer on a regular basis. Each week we receive numerous calls from individuals wishing to apply to VDO because they are in pain, can't eat or sleep and cannot afford dental care. That's why we do what we do. For the second year in a row, local Tim Hortons locations will be supporting the Volunteer Dental Outreach (VDO) for Haliburton County through the annual Smile Cookie campaign. From Monday, Sept. 14 to Sunday, Sept. 20, both the Minden and Haliburton restaurants will be selling freshly baked, chocolate chunk Smile Cookies for $1 (plus tax) with all of the proceeds going to the VDO. The initiative raised over $3,000 for the local charity last year. During the same week, Tim Hortons locations across the country will be selling cookies for charities within their communities. The Smile Cookie campaign started in 1996 to help raise funds for the Hamilton Children's Hospital in Ontario and has grown to become a major fundraising event at Tim Hortons restaurants. Last year, the campaign raised $5.3 million across Canada and supported more than 350 local charities. To date, Volunteer Dental Outreach has been able to help 560 patients by providing 4009 appointments and dental treatment valued at $1,395,887.83 because our community of Haliburton County, as well as many others who live outside our community believe what we are doing is important and provide financial support for the clinic. Next week, treat yourself to a Smile Cookie knowing that at VDO we can provide $5.00 in free dental care for every dollar raised. It was a glorious sunny day, the sunlight dancing off the waters behind Thomas Kovacs as he entertained the crowd of over 60 people who had come out to hear the by donation concert which raised $2465.00 for Volunteer Dental Outreach. This gifted performer sang by request from a song book containing favorites by Gordon Lightfoot, The Eagles, James Taylor, Neil Diamond and hundreds of others, all while encouraging audience participation. Janis Parker and Ron Kozak hosted and sponsored the event which was appreciated by all in attendance. 100% of the money raised will be used to fund the VDO clinic where patients who have met a financial needs screening are provided with free dental care by volunteer dental professionals. Thank you Janis and Ron for your generosity and hospitality. This year's tournament was sold out weeks in advance, the organizing committee, caterers, volunteers, golf course, party rentals.... were all arranged, delicious breakfast served by Abbey Gardens and Blairhampton, and everything was running smoothly until mother nature had other plans. Remarkably, this did not dampen the spirits of those who came to support VDO and the work it does for Haliburton County's people in need of dental care. Despite the rain, the caterers and golfers made the best of a challenging situation. 22 of 35 foursomes completed their rounds, some waited it out in the clubhouse and enjoyed hors d'oevres but all agreed it was a great day. Rhubarb Chef, Christof Carl and his team provided a delicious lunch and Kurt Browning and Bill Kerr entertained the crowd with a lively auction for highly coveted Blue Jay tickets donated by Janis Parker and a Kayak donated by Canadian Tire in Minden. Golf professional Sue Ertl donated her time in a Beat the Pro competition on Hole 2, dozens of sponsors and individuals supported the event which raised over $46,000.00, All of the funds raised will be used to cover the expenses of running the dental clinic in Haliburton where patients with nowhere to turn for dental care due to financial barriers are treated for free by volunteer dentists and dental hygienist. The goal of the Board was to raise half the annual operating budget for the clinic and this amount was surpassed due to the generous support of our sponsors, golfers and donors. The 6th Annual Volunteer Dental Outreach Charity Golf Tournament will be held on August 25, 2016. Detail will be posted on this site next April. The Board of Volunteer Dental Outreach for Haliburton County would like to acknowledge and thank the technicians and owners of First Page SEO, Mark and Roberta Coles for donating so much of their time to creating and maintaining this website. It is such a valuable tool to reach patients who need care, and dental professionals who may be looking for a clinic to volunteer their time in Ontario. You will see a new feature on the home page entitled "Media" which took 5 hours of technician time to produce and in which newspaper clippings, scanned by the staff and co-op student at Parker Pad and Printing have been collected and uploaded to chronicle the media coverage of the development and major donors to VDO. We appreciate all of the hard work put in by Mark and Roberta Coles, Stephen Roome and the staff at First Page SEO for a "first class website," as well and the dedication of Marianne Davis, Kendra Kellet and Nancy Houghton at Parker Pad and Printing for the countless hours they provide to keep this website looking so professional. As of today we have completed 3906 appointments for 536 patients who would otherwise been unable to attend a dental office due to financial barriers. The dental work provided would have cost $1,363,972.83 in a private dental office. This year we are pleased to announce that the Volunteer Dental Outreach was selected by the Coalition of Haliburton Lake Associations (CHA) as its "Charity of the Year." President, Paul MacInnes made an announcement at the Annual General Meeting held at Sir Sandford Fleming College that our organization is looking for more volunteer dental professionals to help with the overwhelming demand for care. Our waiting list is now 53 people who have been approved and are waiting to schedule appointments with volunteer dentists. At the meeting a raffle for Blue Jay Tickets, donated by Janis Parker raised $264.75 for VDO. To date our Board of Directors is pleased to report that our volunteers have provided 3774 appointments for 527 patients with a value of $1,308,659.83 since we opened May 19, 2011. Thank you to Paul MacInnes and the Board of CHA for all the great work they are doing to protect our lakes and for all the support they are giving Volunteer Dental Outreach! The second annual Volunteer Dental Outreach (VDO) Bowl-a-thon was a major success, raising close to $5,000 to help provide free urgent dental care to local residents in need. 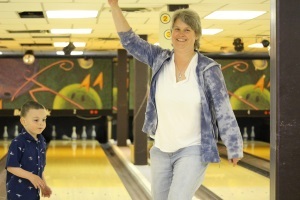 A total of 42 bowlers participated in the fundraiser at Fast Lane Bowling in Minden on May 2. "To be able to nearly match the amount raised at our first event last year is quite a feat," said Mark Arike, event organizer and VDO board member. "The community stepped up yet again and this clearly demonstrates that they are aware of the importance of the services our dedicated volunteers provide." Throughout the afternoon, draws and fun contests were also held with prizes from Canadian Tire Minden and BeBe Bartoons being given away to a few lucky bowlers. Special guests included Haliburton-Kawartha Lakes-Brock MPP Laurie Scott, Minden Hills Reeve Brent Devolin, federal election candidates Mike Perry (NDP), Jamie Schmale (Conservative) and William MacCallum (Green), and volunteer dentists Dr. John Purc and Dr. Michael Proctor. Special thanks go to Sheila and Gord Pitcher, owners of Fast Lane Bowling, for hosting the event. Since its inception in May of 2011, the VDO's team of volunteer dentists, hygienists and other dental professionals have provided $1.28 million in urgent dental care to 521 patients from across Haliburton County. This equals 3,719 separate appointments. With 50 individuals on the waiting list as of May 5, the VDO continues to address an important need in the community. The VDO's next major fundraiser of the year�the fifth annual golf tournament�takes place on Thursday, Aug. 20 at Blairhampton Golf Club in Minden. The event will include a lunch catered by chef Christoph Carl of Rhubarb Restaurant. For more information about the tournament or the VDO, visit dental-outreach.com. Individuals wishing to apply to the clinic or those interested in volunteering can call 705-457-3111 or visit the website. Last year's event was so much fun, we decided to have a second annual bowl-a-thon. Information and pledge sheets are available on this website under Fundraising/Bowl-a-thon. Contact Mark Arike 705 854 1006 to register a team. If you are not yet on a team Mark will assign you a team. This event is fun for all ages and prizes will be awarded for the team and individual who raises the most pledges for VDO. Since opening our clinic in May 2011, the Volunteer dentists and hygienists have provided 3694 appointments and $1,275,709.83 in free dental care for 519 needy patients in our community and the need has not diminished. The Board of Directors would like to thank the Minden Rotary club for their recent donation of $500.00 towards the ongoing initiative to reduce wait times at VDO. In the past few months, with the help of a $10,000.00 grant from HCDC, VDO was able to hire a second part time dental assistant to permit a heightened focus on denture care within the clinic. Many of our patients were waiting for dentures for many years effecting their ability to eat and overall well being. We approached HCDC and Minden Rotary to help with the increased overhead costs of staffing and lab bills and are pleased that the number of dentures we have been able to provide has more than doubled our expectation. Thank you to HCDC and Minden Rotary. Thanks to the Minden and Haliburton Tim Hortons locations for dedicating the proceeds of the 2014 Smile Cookie Campaign to Volunteer Dental Outreach. Owner Nancy Bishop presented the Board of Directors with a cheque for $3169.00 and remarked that they would like to run the campaign on behalf of VDO again September 2015. Thank you to Ian and Tina Myers of Myers Chimney for a very generous donation to Volunteer Dental Outreach. This is the second donation made by the Myers and the donation will be used for ongoing operations of the clinic which has helped over 460 patients living in our community who would otherwise be going without dental care because they cannot afford dental visits. For more information about Myers Chimney go to www.myerschimney.com. The Board of Directors chose to announce that in the past three years, our volunteers have provided over $1,000,000.00 in free dental care to patients in need in our county before a crowd of 165 gathered at Rhubarb Restaurant as part of the Fourth Annual VDO Golf tournament. Dr. Bill Kerr and Janis Parker addressed the crowd of loyal supporters many of whom had been present from the initial planning meetings and construction of the clinic. The day was also special in that the golf fundraiser netted slightly over $40,000.00 in revenue which will be used to cover six months operating costs for the clinic. The winning ladies team was Sandra Slauenwhite-Box, Anita Jupp, Sue DesRoches and Linda Boshan shot 69. Closest to the Hole Mens: Kevin Golding. The Board would like to thank all of our sponsors for their financial support and encourage people interested in playing in next year's event to register early. Volunteer is extremely pleased to announce that Green Shield Canada is supporting our work with a $14,000.00 Community Giving Grant. This funding will help us focus on our goal to reduce the waiting list by allowing us funding to hire a second dental assistant to improve office our efficiency. We are quickly approaching the $1M target in free dental care provided since May 2011. We have now helped 437 patients, having offered 2668 appointments and $958785.56 in free dental care. Thank you to the 60 bowlers who participated in the first ever Bowl-a-thon for Volunteer Dental Outreach for Haliburton County. With your participation and the generosity of your sponsors over $5000.00 was raised to offset the cost of purchasing the digital panorex machine. Thank you to the Fast Lane for being such hospitable hosts, to Canadian Tire for supplying the door prizes and to Tim Hortons for supplying coffee. The Board would like to host a second bowling event early May 2015 because we had so much fun! Check out the May 1st issue of The Highlander or Highlander online to see photos of the event. The clinic is well on its way to providing $1M in free dental care and as of May 23 has provided 2540 appointments for 419 patients and $919,524.91 in free dental care to those in need in our community. Congratulations to Grade 10 Haliburton High School Students, Cassandra Johannessen, Caleb Schmidt, Amy Black, Jonathon Prestwich and Emma Cox for their successful presentation on why Volunteer Dental Outreach for Haliburton County should be awarded a $5000 grant from the Toskan Casale Foundation which manages the Youth Philanthropy Initiative. The VDO Board of Directors is extremely grateful to this hard working group of young people that they selected this Charity as the focus of their project and to their teacher Mr. Paul Longo for encouraging this project to be part of the Grade 10 Civics curriculum at Hal High. These hard working students were able to convince a panel of judges that the work done at the Volunteer Dental Outreach is worthy of funding. In order to qualify, the successful organization must provide a direct social service to the local community. To date we are proud to report that our volunteers have provided 425 patients with $937,303.41 in FREE dental care which has included 2598 in appointments at the clinic. We have also had the benefit of free dental lab work provided by Brentwood Dental Labs of Markham,Ontario and regularly receive discounted dental lab work from Image Dental Labs of Barrie Ontario. Volunteer Dental Outreach would like to thank The Rotary Club of Haliburton for a recent donation of $2500.00. This money will allocated directly to patient care and used to purchase needed dental supplies. We now have completed close to $887,524.62 in free dental care and treated 414 patients, offered 2458 appointments to low income residents of Haliburton County. Our next planned fundraiser is a Bowl-a-Thon to take place April 26 at the Fast Lane (705 286 3900) in Minden. Come enjoy a light hearted afternoon of fun while supporting a good cause. Call Mark Arike 705 854- 1006 for more detail and to register yourself, a team or make a donation. The Board of Directors is planning to host a Bowl-a-thon in support of the Volunteer Dental Outreach Capital campaign to raise the funds to pay for the Digital Panorex machine. The event will take place on April 26 and will consist of a 1-3 p.m. flight and 3-5 p.m. flight. A pledge of $20.00 or more will get you in! The bowl-a-thon will be held at The Fast Lane in Minden, located in the Shell Plaza. We are pleased to report that to date our dental professionals have treated 410 patients, provided 2417 appointments valued at $873,041 since opening May 19, 2011 and demand continues to grow for our dental services. If you can't bowl, consider sponsoring a bowler. Our patients continue to count on us to provide dental care and our program relies on donations and fundraisers to cover operations and equipment purchases. To register contact Mark Arike at 705 854-1006 or the Fast Lane at 705-286-3900 Individual and Team entries welcome. Another major milestone was reached Friday December 6. Dr. Bradley Oldfin and Dr. Michael Proctor worked together Friday as the overall total of free volunteer dental treatments reached $751,413.95. The Volunteer dental professionals have now provided 2096 appointments for 373 patients. Congratulations to all the volunteers who have contributed to this achievement. So far we have had 17 dentists, 16 hygienists, 11 dental assistants, 8 dental administators, Image dental lab and Brentwood Dental Labs as well as Oral Surgeon Dr. Eddie Renish of Crescent Oral Surgery contribute their time and talents to this remarkable achievement. The 373 patients of Haliburton County who have been helped by your generosity are healthier and happier due to your efforts. We are happy to report that Dr. David Butera has now joined the dentists who volunteer their skills for the benefit of Haliburton patients who have no financial means to pay for dental care. Thank you to all who have donated time and provided financial support to the Volunteer Dental Outreach. We have now provided $713,616.85 in free dental treatments for 360 patients in 1990 free dental visits. To those of you who have volunteered watch your mail for an invitation to our first Volunteer Celebration to honour those of your who have contributed to the better dental health of our community. It will be on October 27 at Bonnie View Inn. We are also very pleased to announce that we have had two new dentists sign on in October: Dr. Joseph Tabri and Dr. Robert McKay. We also have new volunteer hygienists Shea Houston, Roxanne Ryan and Lisa Marie Billings. Welcome aboard we are thrilled to have you join Volunteer Dental Outreach. The other big news is that the Board of Directors voted to purchase a new Direct digital Panorex machine which will be installed soon and used as an important diagnostic tool by our Volunteer dentists to diagnose our patients. There were a lot of smiles at the 3rd Annual Volunteer Dental Outreach Golf Tournament. Event organizers are estimating that $25,000 was raised by the 123 golfers and volunteers who attended. 1st Place Ladies team with a score of 82 was Barb Bolin, Lynn Bartlett, Connie van Parys and Charlene Daville. I hope those of you who attended this year's event will come and join us next year. For anyone who missed it and would like an email notice next year's tournament please contact Lisa at volunteerdentaloutreachhc@gmail.com and we will add you to the mailing list. Otherwise watch this site for details. A tentative date for next year's tournament is Thursday August 21, 2014. If you are interested in what the clinic has achieved to date, we have now seen 332 patients, number of appointments 1762 and value of free dental care provided $633,518.35 in free dental treatments. Thank you to Ron Kozak and Janis Parker for hosting another successful fundraiser concert at their home on Kennisis Lake. Thomas Kovacs didn't disappoint the group as he sang many favorites on a beautiful sunny day. Thank you to everyone who attended and gave so generously to Volunteer Dental Outreach.